The Art of Marriage Small-Group Study features expert teaching by over 40 ministry leaders, real-life stories, humorous vignettes, and more to portray both the challenges and the beauty of God's design. Six weekly group sessions are paired with couple's date nights to encourage husband-and-wife discussion and growth. 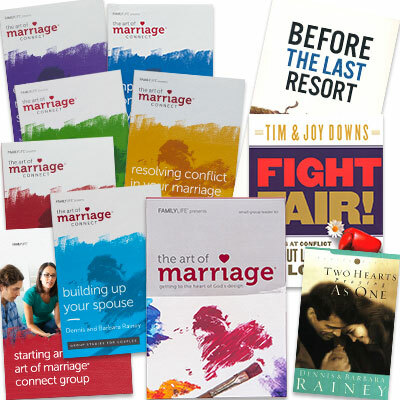 The Art of Marriage Connect Sample Pack includes one copy of each study in the Connect series. These five-to-seven-week studies enable couples to dive deeper into marriage topics with other couples in the small-group setting. Before the Last Resort, Fight Fair! and Two Hearts Praying as One: A library of marriage books gives couples opportunity to explore issues on their own. We chose these three titles as a good starting point for a library. Would you rather begin with a large-group event? You'll find the same Marriage Ministry pack here but with The Art of Marriage Video Event Kit.